The Moving Company Australia would like to welcome you to our website, the only place you need to be to find out about interstate removalists servicing this great nation of ours. For years, we have continually supplied excellent service and low prices when transporting furniture and other belongings. We mostly service the East Coast of Australia, with a convoy of moving trucks working from Cape York to the Great Ocean Road. No matter the size of the job, we promise to deliver your belongings to the proper destination without excessive mover costs and a lot of unwanted hassle. 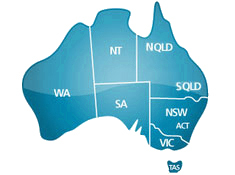 If you wish to move to South Australia, Western Australia or the Northern Territory, we can help there too. Our trucks travel those roads on a monthly basis so get in touch today and see how we can fit in our removal services with your timetable, destination and other requirements. Since every client is different, we have a wide range of vehicles available. From small minivans for light loads to large furniture trucks for interstate moves, we can supply you with a form of transportation that suits your needs whether you’re travelling from Sydney to Wollongong or Adelaide to Townsville. Our team will also deliver outstanding service guaranteed. After arriving at your home or workplace on time, they will assist with loading the truck, drive it to the intended destination and then unload everything. All this will be done with a smile too, ensuring complete customer satisfaction every single time. For those with a box or two to send interstate, we also offer an affordable backloading service. By placing your belongings in a truck or van that’s already heading to the right location, you can get the distance covered without hassle while saving a lot of money on moving costs. If you need help prior to the move, we can send round enough moving boxes and packing supplies to help secure your belongings. Our removalists can also come organise your things through our affordable, convenient pre-packing service. We aim to make this process as simple and as stress-free as possible. What happens if your new house or workspace isn’t ready yet? In these cases, we also have a variety of self-storage options available. With our fully serviced van line, we can transport your belongings to the storage facilities too, keeping your things safe until you are ready to move properly. To find out how much our services will cost you, click the Quotes button and fill in your details. We will get back to you via phone or email and let you know the total rate. You can also get in touch with our team if you would like to find out more about our fleet of interstate removalists. Simply give us a call on 1300 79 99 02 or email us on Quote@Moving-Company.com.au today! We are happy to discuss our moving services and provide advice on which package is most suitable. "Thank you for helping move my fridge. I was really happy I only had to pay for one hour". "Your guys were really good with our office relocation. It was great that you could supply the extra labour as well". "Thank you for your patience and making the the 3 drops. It was so cheap and saves us hiring a truck".